The mobile phone revolution is allowing countries to skip investing in landlines, prompting many observers to assume that countries might also skip building an electricity grid and jump right to distributed home energy systems (e.g., here and here). New disruptive technologies are exciting and alluring, especially in sub-Saharan markets where the unmet infrastructure needs are huge. After all, if you can charge your smartphone with a rooftop solar kit, then who needs power plants and a grid? Mobile phones do indeed provide a useful insight for energy: not that you can leapfrog a modern power system, but that most energy use happens out of sight. 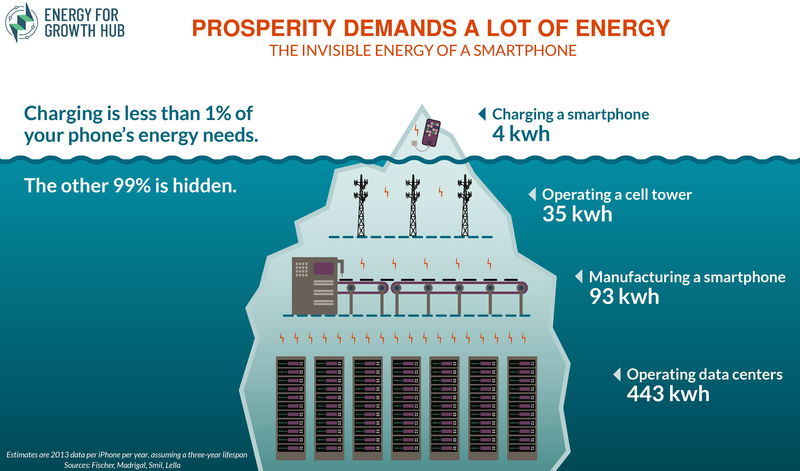 In fact, less than 1% of the energy needed for a smartphone is used by the phone. The other 99% is needed to operate cell towers, run data centers, and actually manufacture the phone—which Ethiopia already does and Kenya hopes to do soon. The Energy Iceberg shows that even in a digital economy, countries still need more than a phone charger—they need reliable affordable power at scale. To learn more about why we should be focused on large scale energy for industry that drives growth and job creation, listen here.